The weather is warming up and new life is emerging after a long winter. Spring is one of my favorite times of year to get children outside to check out the changes in nature. Sometimes though, it is helpful to bring nature inside. 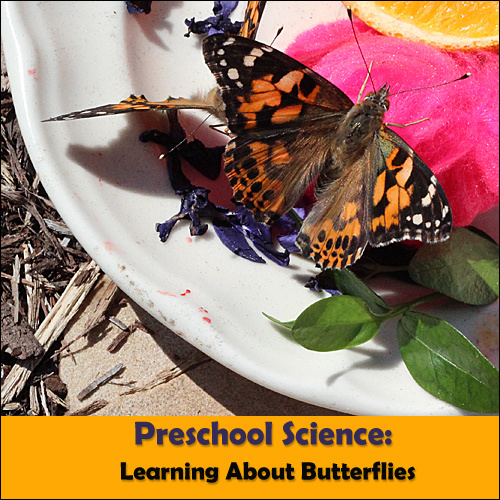 One up-close science activity that young children can do this spring is to raise butterflies. 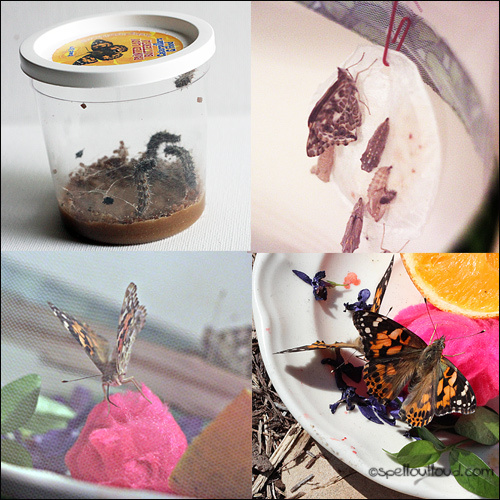 Children are fascinated to see the life-cycle of a butterfly happen before their own eyes! It is one thing to read about it and another to see it happen in real life. 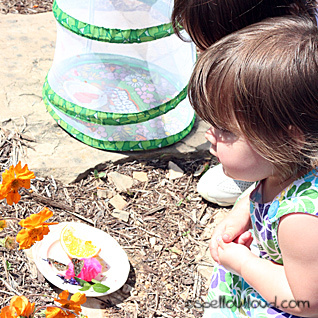 Once you obtain the caterpillars, make sure to set aside time each day to observe them with your children. What does the caterpillar look like? What color is it? What do you notice about the caterpillar? Do you see anything different when you look through the magnifying glass? See if your child comes up with any “I wonder…” questions and work together to find the answers. 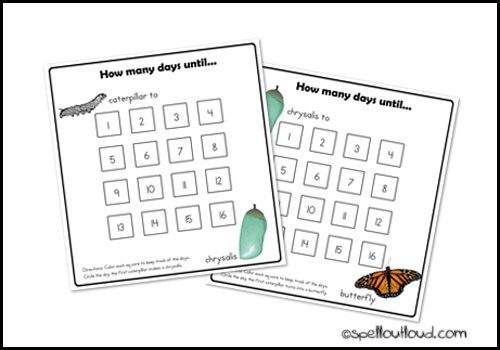 Start a chart and keep track of how many days it takes until the caterpillar creates a chrysalis. Once the chrysalis is formed, keep track of how many days it takes before the butterfly emerges. During your observations, introduce some butterfly vocabulary. 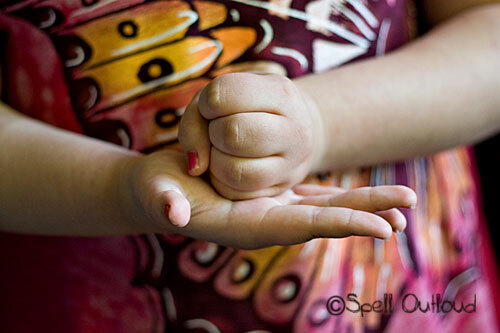 You will be surprised at how much a preschooler can understand and remember. The goal is to introduce your child to scientific terminology, not necessarily have them obtain mastery of these words (but many children will do just that.) You can print out a butterfly terminology chart to print out and place in a science notebook, science center, or as a reference poster. There are so many directions you can go with a butterfly theme. Follow your child’s interests. There are butterfly crafts, books, games and more. I love to incorporate songs and rhymes to help young children remember key concepts. One song we sing during this unit is “My Metamorphosis.” It has crafts and actions that go along with the tune. You can find the complete song plus instructions here: Butterfly Unit for Young Children. When it is time to release the butterflies, make a special event out of it. Our family had a butterfly picnic. We had noticed during a nature walk at our local museum that there were many butterflies there. So when it was time to release ours, my kids decided the museum gardens would be the perfect butterfly habitat. Now whenever we walk through the garden and see a butterfly, the kids proudly claim it as one of their own. Will you be raising butterflies this year? Maureen Spell is a former elementary school teacher who now has a classroom of 7 at home. She blogs at Spell Outloud, a blog that has nothing to do with spelling and everything to do with learning. With kids ranging from toddler to teen, she highlights many homeschool activities, toddler and preschool crafts, and free printables. You can follow Maureen on Google+. Be sure to stop by her blog to download a free Butterfly Nature Journal. I needed this this week since we’ve started our butterfly garden. Thanks! When do you think is a good time to get catipillars/butterflies? I have been thinking when it is a steady 50 degrees, maybe May or June. What do you recommend? I live in the Midwest, so I usually get our butterflies in late May so that when we release them it is warm enough for them to survive.